How Much Does a French Bulldog Cost? Home - blog-How Much Does a French Bulldog Cost? How Much Does a French Bulldog Puppy Cost? French Bulldogs are some of the most sought after dogs on the planet right now, and for good reason. They’re some of the most adorable, lovable, charismatic, and well-behaved dogs you and your family will love for many years to come. The starting price for a Frenchie typically goes from $3,500-$5,000 for the basic colors. The costs associated with French Bulldogs is associated with the high demand, yet the higher costs are more affiliated with the true effort and work it takes to ensure a French Bulldog puppy is able to grow into a healthy and happy French Bulldog from zero to eight weeks of age. Upon eight weeks of age, you’ll be able to pick up your beautiful, healthy, and happy French Bulldog from Dream Valley Frenchies; yet what goes on between zero to eight weeks you may ask? Well, we’re glad you want to know! Below is a cumulative list of the common steps we take to provide you with the highest quality Frenchies imaginable. The above regimen requires little to no sleep of caretakers for a month to a month and a half; often equivalent to raising a newborn child, yet multiplied by anywhere from 6-12 puppies! Maintaining a sterile environment around the clock to prevent sickness from Parvo. This means heavily regulated cleaning regimens involving bleach and other medical-grade cleaning agents. The above is just a small sample of what is involved in successfully raising a litter of French Bulldog puppies. Why Are French Bulldogs More Expensive Than Other Dogs? As stated above, it’s a combination of high-demand and heavy involvement with care taking of the Frenchie puppies from day 1. Other dog breeds require an extremely lesser amount of attention and care taking. With other dog breeds, you don’t have to constantly monitor the mother and her young to ensure the puppies are not being squished, you don’t have to ensure they’re not choking on the mother’s milk, and the puppies from other dog breeds will more instinctually figure things out whereas with Frenchies, you have to gently guide them every step of the way until they’re eight weeks of age. From there, they’ll have everything figured out and be able to thrive without constant assistance. How Much Does a Blue French Bulldog Cost? Blue French Bulldogs range in price typically starting at $4,500 and going all the way to $7,500 for exclusive variations of exotic blue Frenchies. The exquisite color they possess increases their price, yet they’re very much worth it in our opinion. 🙂 Another aspect which increases the price of blue Frenchies is the fact blue variants will often have much smaller litters than a Fawn French Bulldog. The average litter size for a Blue Frenchie is around 3-5, while a fawn can have anywhere from 6-9 puppies with each litter. How Much does a Merle French Bulldog Cost? A Merle French Bulldog is amongst the highest priced French Bulldog Available. On the lower-end, Merle French Bulldogs can start at $10,000 and go all the way to $25,000-$100,000. It ultimately depends on which variation and rarity you want of the Merle lineage. The exclusivity and rarity of a Merle French Bulldog is primarily responsible for the price. Whether you choose a more common Frenchie or an all-out, exclusive French Bulldog; you and your family’s heart will be content for many years to come. If you treat a French Bulldog as an amazing investment into your you happiness, you’ll be more than satisfied. French Bulldogs are know for their unbiased affection and love they give to their owners. We know your heart will be warmed every time they greet you with their big, silly smile. Choosing Dream Valley Frenchies for Your Cute & Cuddly Frenchie! 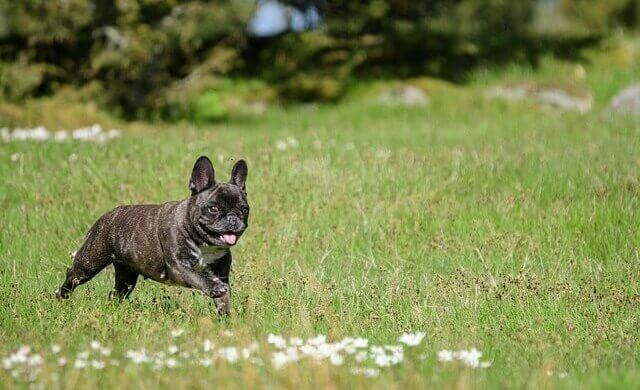 When you choose Dream Valley Frenchies for your future Frenchie, you’re choosing a breeder who truly cares about each and every one of our French Bulldogs and their future owners. All of our French Bulldogs are AKC-registered and have a one-year guarantee of health. We want you to find your next best friend as soon as possible. Feel free to click the button below to begin the application process for Frenchie ownership and we’ll be sure to repsond to your inquiry as soon as possible. We look forward to hearing from you soon!